Many people think zinc is best as an immune-boosting remedy. While it is true that the essential trace mineral is important for the immune system, zinc health benefits may go well beyond the common cold. A diet high in zinc foods is necessary to help maintain health and perform daily bodily functions. Zinc benefits the body in a variety of ways, including digestion; growth and repair; hormone production; and treating various chronic diseases like cancer, diabetes, and heart disease. Zinc is found in all bodily tissue, and is required for healthy cell division. It is also an antioxidant that slows the aging process and fights free-radical damage. That is why even a small zinc deficiency can lead to a number of adverse effects, including infertility and hair loss. However, it is possible to negate these effects with enough zinc in the diet. What are the health benefits of zinc? The top benefit is the effect zinc has on the immune system. Research suggests supplementing with zinc for at least five months may prevent the common cold, while also reducing symptom frequency when you are already sick. Zinc is also important for the cardiovascular, digestive, reproductive, and muscular and skeletal systems. 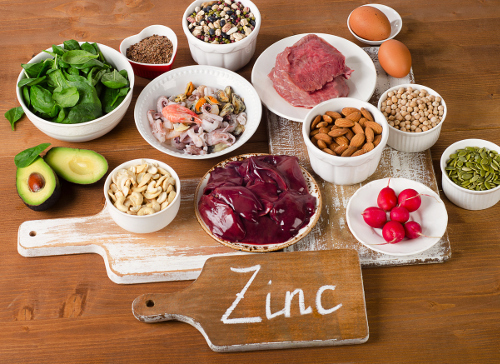 The following is a brief description of five purported zinc health benefits. A study published in the American Journal of Clinical Nutrition in 2007 found that levels of oxidative stress were lower in a zinc-supplemented group than a placebo group. The anti-inflammatory and antioxidant properties of zinc help fight oxidative stress, which could reduce the risk of diseases like cancer. Zinc may also prevent tumor growth and cancerous cell mutation, especially in the elderly. Zinc is very important for digestion, and it is involved in carbohydrate breakdown. Since carbs are a main energy source for the body, zinc deficiency may lead to low energy levels. Low zinc is also associated with chronic digestive problems like diarrhea. Zinc is also necessary for protein synthesis, nutrient absorption, and it can decrease liver inflammation, and allow for proper waste elimination. Since zinc is important for cell growth and division, zinc benefits muscle growth and repair by allowing the body to maintain strength while healing the skeletal and muscular systems. Zinc can also build muscle mass and boost metabolism with the release of growth hormone, testosterone, and insulin-like growth factor-1 (IGF-1). Zinc will benefit muscle mass and increase testosterone, especially after weight lifting and high-intensity interval training. Studies indicate that one of the many zinc health benefits is increased fertility. In particular, zinc deficiency and dietary zinc restriction is linked with low serum testosterone concentrations in young men. As a result, low zinc could possibly lower libido and have a negative impact on fertility. In female fertility, zinc benefits egg growth and successful ovulation. Zinc is also needed in women for the production of beneficial reproductive hormones, progesterone and estrogen. Also, estrogen levels that are too low or too high can lead to early menopause, mood swings, menstruation problems, and infertility. Since the mineral is needed for balancing hormones like insulin, zinc may also help fight diabetes and balance blood sugar. Zinc helps bind insulin to help store insulin and release it when glucose enters the bloodstream. Zinc also helps utilize digestive enzymes needed for insulin to bind cells so that glucose is used as energy and not stored as fat. Zinc is often available in various forms, such as syrups, gels, lozenges, and capsules. It is also found in most multi-vitamin and mineral supplement formulas. Zinc supplements will contain zinc sulfate, zinc acetate, or zinc gluconate, which are all thought to work in similar ways. The foods highest in zinc are those also rich in protein, especially animal proteins such as high-quality grass-fed meats, certain wild-caught seafood, and raw, organic, and unpasteurized dairy products. Keep in mind that the absorption rate of zinc is best from animal-based foods rather than plant-based foods. Although zinc is found in grains, as mentioned, the body cannot use the zinc because it attaches to phylates that block zinc absorption. For that reason, animal sources of zinc are best; however, some plant-based zinc food sources like legumes, nuts, and seeds are also included on the list of best zinc foods. The following is a zinc foods chart that is helpful for learning what foods can help you avoid zinc deficiency. The chart will keep you abreast of which whole foods are highest in zinc. Although there are many zinc health benefits, when taking high doses of zinc supplementation, there are a few things to keep in mind. For instance, high amounts of zinc can interfere with the body’s absorption of other minerals like copper. This can impair blood cell formation and depress immune function. However, it is more common to experience minor and short-term high zinc symptoms, including a bitter taste in the mouth, diarrhea, indigestion, nausea, vomiting, and abdominal pain and cramps. The symptoms will occur within three to 10 hours after taking zinc supplementation, but the problems often disappear shortly after you stop taking the supplements. Mateljan, G., The World’s Healthiest Foods: Essential Guide for the healthiest way of eating (Seattle: George Mateljan Foundation), 802-803. “15 Incredible Benefits of Zinc,” Organic Facts; https://www.organicfacts.net/health-benefits/minerals/health-benefits-of-zinc.html, last accessed April 26, 2017. “Nordqvist, J., “Zinc: Health benefits and warnings,” MedicalNewsToday; http://www.medicalnewstoday.com/articles/263176.php, March 28, 2017. Hulisz, D., et al., “Efficacy of zinc against common cold viruses: an overview,” Journal of the American Pharmacists Association, September 2004; 44(5):594-603. https://www.ncbi.nlm.nih.gov/pubmed/15496046. Rodriguez, H., “Zinc: How Essential Is It to Your Fertility?” Natural Fertility Info; http://natural-fertility-info.com/zinc-fertility.html, last accessed April 26, 2017. Jayawardena, R., et al., “Effects of zinc supplementation on diabetes mellitus: a systematic review and meta-analysis,” Diabetology & Metabolic Syndrome, April 2012; 4:13. DOI: 10.1186/1758-5996-4-13. Prasad, A.S., et al., “Zinc supplementation decreases incidence of infections in the elderly: effect of zinc on generation of cytokines and oxidative stress,” American Journal of Clinical Nutrition, March 2007; 85(3): 837-844. https://www.ncbi.nlm.nih.gov/pubmed/17344507.